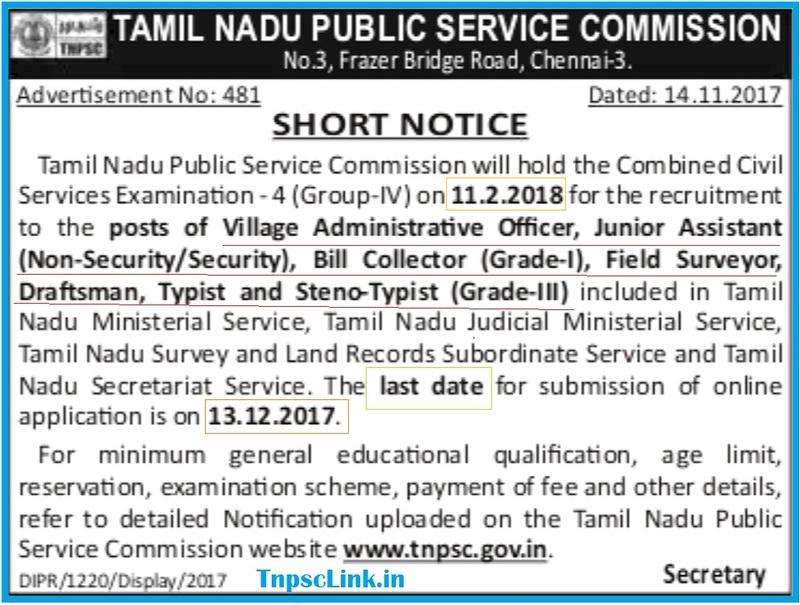 Tamil Nadu public Service Commission (TNPSC) will hold the Combined Civil Service Examination - 4 (Group IV) on 11.02.2018 for the recruitment of the Posts of Village Administrative Officer, Junior Assistant (Non Security/ Security), Bill Collector (Grade-I), Field Surveyer, Draftsman, Typist and Steno-Typist (Grade III) included in Tamil Nadu Ministerial Service, Tamil Nadu Judicial Ministerial Service, Tamil Nadu Survey and Land Records Subordinate Service and Tamil Nadu Secretariat Service. The Last date for Submission of Online Application is on 13.12.2017. 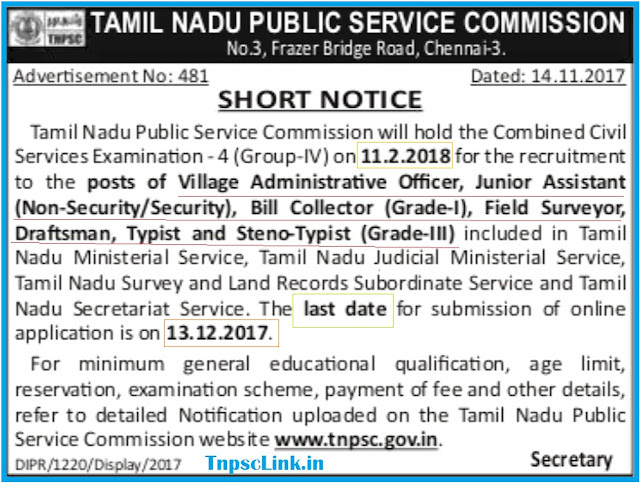 For Complete Notification, Minimum General Educational Qualification, Age Limit, Reservation, Examination Scheme, Payment of Fee, Syllabus, and other details fefer to detailed Notification uploaded on the Tamil Nadu Public Service Commission website www.tnpsc.gov.in. How to prepare, how to apply online application form, notification, eligibility, syllabus, exam date, last date, hall ticket download, schedule and scheme of exam, Syllabus and Study Material and results you can get here. All the Best. Must possess Minimum General Educational Qualification viz. Must have passed S.S.L.C Public Examination or its equivalent with eligibility for admission to Higher Secondary Courses of Studies (or) to College Courses of studies. Must possess Minimum General Educational Qualification viz., Must have passed S.S.L.C Public Examination or its equivalent with eligibility for admission to Higher Secondary Courses of Studies or to College Courses of studies. I. Must possess Minimum General Educational Qualification viz., Must have passed S.S.L.C Public Examination or its equivalent with eligibility for admission to Higher Secondary Courses of Studies or to College Courses of studies. iii) by Higher / Senior Grade in English and Lower/ Junior Grade in Tamil. Public Examination or its equivalent with eligibility for admission to Higher Secondary Courses of Studies or to College Courses of studies. by Higher / Senior Grade in English and Lower/ Junior Grade in Tamil. Candidates with technical qualification referred to in item (i) will be selected first. In case candidates with technical qualification referred to in item (i) are not available, candidates with technical qualification referred to in item (ii) will be selected. i) Two types of question papers will be set. Type- 1: General Studies (75 items) + Aptitude Test (25 items) and General English (100 items). Type-2: General Studies (75 items) +Aptitude Test (25 items) and General Tamil (100 items). Candidates are given the option to choose either General Tamil or General English for answering the second 100 items apart from answering the first (75+25)100 items on General Studies and Aptitude Test. ii) The questions on General Studies will be set both in English and Tamil and the questions on General Tamil/ General English will be set in the respective languages. TNPSC Study Materials for TNPSC CCSE 4 (Group IV) 2018 Village Administrative Officer, Junior Assistant (Non Security/ Security), Bill Collector (Grade-I), Field Surveyer, Draftsman, Typist and Steno-Typist (Grade III) Posts. This Study Materials covers Tamil Notes, Quiz, Model Questions and Answers in PDF Format Download.